For over two centuries a prolific iron industry wielded huge influence over the development of many Morris County communities. In particular, the forges, furnaces, and mines of Dover, Wharton and Boonton, all located along the banks of the Rockaway River, were intimately connected from the early 1700s through the heady times of the Morris Canal and the subsequent railroads. In 1868, a blast furnace reported to be the largest in the country, was developed in Wharton, then known as Port Oram. Some of the ore from the mines here was shipped to Boonton for processing. Completed in 1830, the Boonton Iron Works later expanded to include a blast furnace and became one of the largest manufacturers of cut nails in the country. Although Dover also had roots firmly planted in iron, it was an older settlement with a population of several thousand by the time Boonton and Port Oram became established and was more independent from the day-to-day working of the furnaces than either of the other communities. The four-story plant built by Pelgram and Meyer on Monroe and Lincoln Streets in Boonton employed 500 people until it shut in 1927. It is now home to Kanter Auto Products. Although some mines operated until the mid-1900s, New Jersey's iron era began a frightening decline around 1876. A crisis loomed in these communities whose churches, schools, banks, stores, homes and people had all arrived to answer the call of iron and its products. 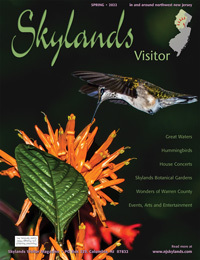 But these people ­ the ones that stayed around ­ knew how to work, and the Rockaway River still flowed. The towns found ways to diversify into other manufacturing enterprises as the nineteenth century gave way to the twentieth. 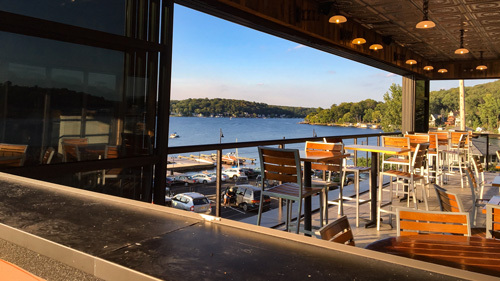 Some of the more successful of these ventures gave Dover, Wharton, and Boonton something to shout about and in some cases, world-wide celebrity. The still-impressive building that once housed Guenther’s silk mill once dominated Dover’s landscape. About the time iron making was slowing down, silk production was gearing up. Paterson was home to several silk manufacturers, many of whom ultimately moved into Morris County. While Dover, Wharton and Boonton all began developing other industries, it was silk that provided the initial burst of activity, and silk that remained active well into the 1920s. Interestingly, while Port Oram and Boonton were closely tied through mining ventures, Dover and Port Oram ultimately became united through the silk industry with many plants moving from one town to the other over the years. The most prestigious of all of the silk mills was undoubtedly Guenther's Silk Mill in Dover. Paul Guenther was a German immigrant who came to Dover in the 1890s and rented space from the Swiss Knitting Mill on Spruce Street, which had grown into a very large 2-story structure by 1896. The Singleton Silk Manufacturing Company was also in town by this time, along Granny's Brook on Park Heights Road, and the Ross and Baker silk company rented space from them. By 1885, Ross and Baker had moved into Wharton. Singleton followed, and Guenther moved into town. In 1902 Guenther moved his company over to King Street. He built a 2-story structure that eventually grew into the massive manufacturing complex which even today covers two city blocks. Connecting the mill buildings is an elevated breezeway over King Street, completed in 1921 along with the fifth mill building. Driving under the bridge, the enormity of the complex becomes apparent. While Guenther built an empire, employing approximately 1,000 workers by 1925, he also built housing for his employees along King, Berry, and Searing streets, as well as churches and community centers. Many of his workers came from Guenther's native Germany, and the Germania Park section of Dover was formed with his encouragement. Guenther's silk put Dover back on the map. He used only the best machinery, and employed only the most skilled workers. His products, sold through Lord and Taylor department stores, became world famous. The Onyx Pointex stockings developed here were the first affordable, fashionable silk stockings and became a sought after product. The reenforced heel was also debuted here, said to have done much to enhance the appearance of the wearer's legs. 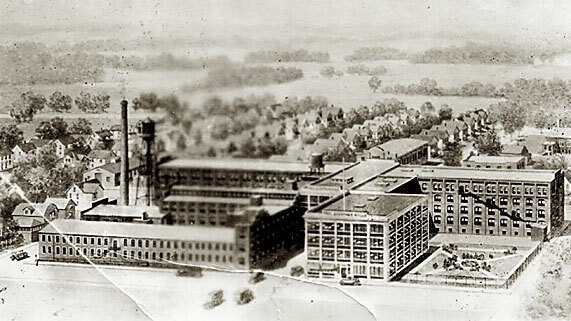 The Guenther silk mill became the largest hosiery manufacturer in the world. By the time the business was sold in 1927 to the Gotham Silk Company, the silk industry, like the mining industry before it, was running out of steam and, by the end of the 1930s, the mill closed. In 1942, the McGregor manufacturing company moved in and began to make world-famous sportswear. During WWII, twill jackets for the armed forces were manufactured here. In 1944, at the return to civilian production, the company employed 700 people. Today, Guenther's famous silk mill still stands, utilized mostly as warehouse space, but filled with glorious memories. Silk manufacturing came to Port Oram (Wharton) when Ross and Baker relocated there in 1884, providing employment for the women and children of the area. While the blast furnace remained important until 1911, the town had learned the wisdom of diversification. Port Oram became an important ancillary to Dover's silk industries and boasted the "best equipped dye house in NJ," according to old accounts. The site of all of the silk business stands at the foot of Washington Forge Pond, on Main Street. The brick silk mill built by Ross and Baker around 1907 on the former site of the Washington Forge in Wharton. The brick building was built by Ross and Baker around 1907 on the former site of the Washington Forge. Singleton Silk also occupied space here, from about 1907 - 1917, as did several other silk companies. The dam at the pond was enlarged to provide power for the mills. Several new buildings were built, and by 1914 several hundred people were employed in Wharton's silk industry. Records indicate that some of the other companies involved in the Wharton's silk industry included Lake and Langdon Silk Manufacturers, who also had a retail store in Dover, and the Wharton Textile Company, which made hosiery for men using Japanese and Belgium silk. The silk industry here also died out by the 1930s, and L.E. 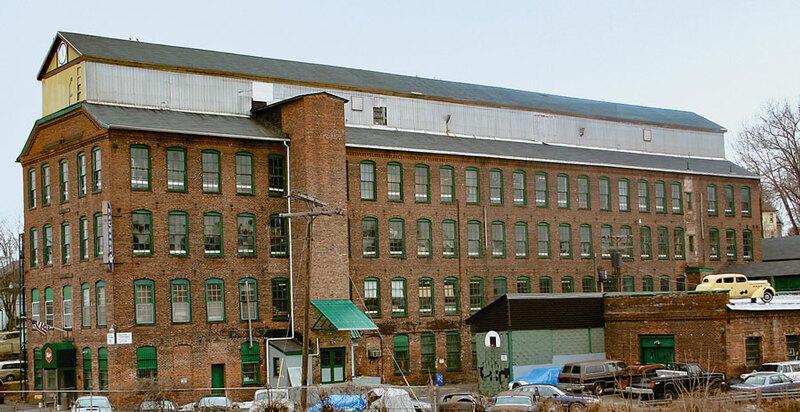 Carpenter utilized the mill buildings to manufacture fabrics for the armed forces during WWII. Later, they made fabrics for use in car interiors, shoes, and handbags. Ultimately, they produced vinyl products for wall, floor, and furniture coverings, providing employment for several hundred area residents through the 1980s. In Boonton, more than anywhere else, hopes were pinned on bringing silk manufacturers from nearby Paterson to town. With the town's major employer closed, workers were fleeing town, and Boonton was in trouble. Any hope that the Boonton Ironworks would rise again was crushed when Joseph Wharton chose to invest in the Port Oram furnace after a brief attempt in Boonton. The town banded together and raised a "silk fund" to offset the cost of building a silk mill. Amidst much fanfare the mill was built in 1875. 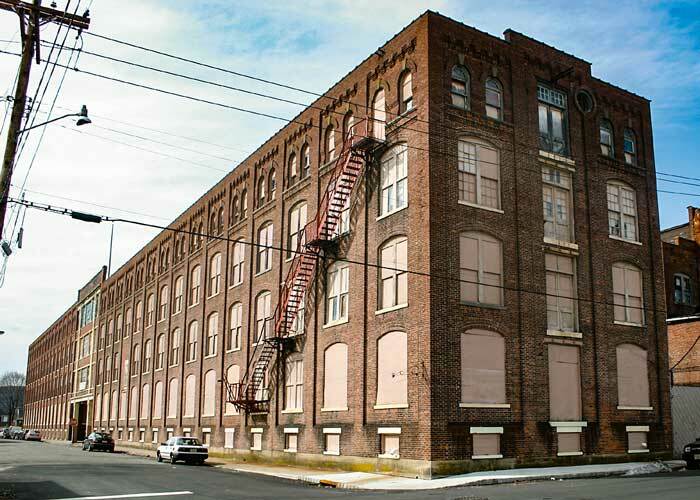 It quickly failed, and the building was vacant until Pelgram and Meyer, silk manufacturers from Paterson, took over in 1880, providing employment for over 100 residents. As the operation expanded, the firm built a four-story mill on Monroe and Lincoln Streets and leased addtional space on Main Street at the foot of Boonton Avenue in the Ball Building. The new mill structure was reported to employ an additional 500 people and continued to do so until it shut in 1927. By 1885 several different companies had been established in the buildings of the old Ironworks, most of which made machinery parts or steel for industrial use, such as in skyscrapers and bridges. Numerous fires eventually demolished the old Ironworks buildings, and most of the companies left the area afterwards. The silk mill had ultimately served its purpose. 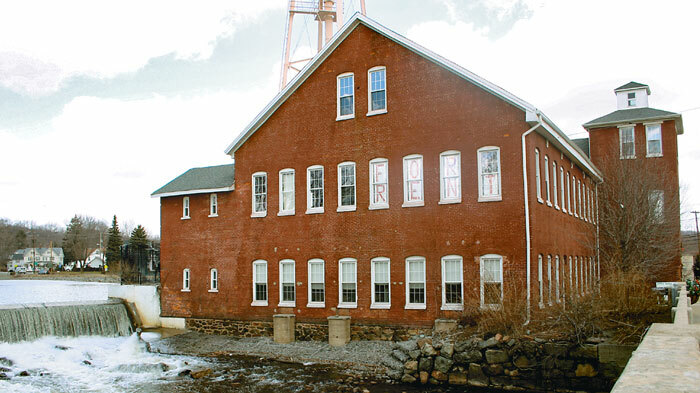 It employed Boonton residents while the ironworks failed and kept the town alive. 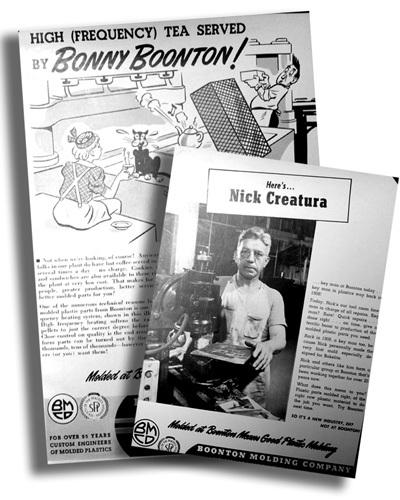 1940s trade advertising for Boonton Molding Co. featured cartoon spokesperson Bonny Boonton as well as long-time employees like Nick Creatura, who made the first mold especially designed for Bakelite in 1908. One other turn-of-the-century company kept Boonton on the map as a premier manufacturing center. It was the Loanda Hard Rubber Company. Founded in 1891 by Edwin A. Scribner, it became legendary not only for the products it manufactured, but for the subsequent industries it spawned, some of which still operate in the Boonton area today. Scribner who had been a chemist at the U.S. Electric Company in Newark, founded the rubber company to manufacture hard rubber goods for electrical insulation and other products. By 1909, Loanda was recycling rubber tires at the rate of 20,000 lbs. per month. The Loanda Hard Rubber Company changed names and became the Boonton Hard Rubber Company in 1906. Richard William Seabury Sr. took the helm following Scribner's death in 1898. Seabury took interest in research chemist Leo H. Baekeland, who was working to formulate a hard plastic molding material from synthetic resin. Seabury provided Baekeland with laboratories at the rubber company, and the product perfected here became known as "Bakelite", first molded in 1907. Bakelite found use in a diverse array of products, and the company expanded to employ about 200 people by 1915. In 1922, Seabury founded the Radio Frequency Laboratories in Boonton Township and concentrated on electronics and communications. Hiring engineers from Harvard and other respected schools, Seabury began what became a growing phenomena in Boonton Township: the development of world class radio and electronics firms. Some of the firms which grew from RFL include Aircraft Radio Corporation, Ballentine Laboratories, and Ferris Instruments. The rippling effects of Seabury's founding of RFL are still evident in Boonton Township, and some of the old airfields here now part of the township's recreational fields. George Scribner, son of Loanda founder Edwin Scribner, opted to continue the business of plastics molding and established Boonton Molding. The company went on to produce the famous Boontonware dinnerware, molded plastic plates, bowls, and cups manufactured in the 1950s and 1960s. 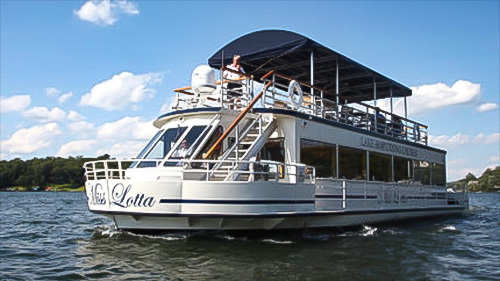 The company also operated a factory outlet store in Boonton for many years. Silk manufacturers where not the only ones making headlines in the other towns, either. Dover especially displayed a great diversity of industry around the turn of the century, and many of those products were sold nationwide. Cooking ranges and furnaces came from the Richardson and Boynton Stoveworks, denim work clothes from the Brotherhood Overall Factory, and artificial ice and ice cream from the Hygeia Ice and Ice Cream Company. We are constantly reminded of the unending procession of economic change in our world. But, from these challenges come opportunities, and it is comforting to remember the resilience of Boonton, Dover, and Wharton one hundred years ago. Thanks to Mr. Richard W. Seabury III, a resident of the Towaco section of Montville for sharing of his family's business and personal accounts. Thanks also to the Historical Societies of Dover, Wharton and Boonton.